SO WE DIDN’T GET into the Eurovision final. So what! We can get gay married and drown our Eurovision sorrows with a good old drinking game. All you’ll need is a telly, some pals (or Twitter pals) and a beverage of your choice – wine, beer, tea, whatever suits. Didn’t you hear? Capes are big news at Eurovision this year. Drink every time you see one, and pray someone doesn’t do a Madonna (or pray someone does, if you’re into that sort of thing). Like this one, from Belgium (above): “We’re gonnara-ba-bab, ra-ba-bab/ We’re gonnara-ba-bab tonight”. You can have that one for free. Norton loves his zingers. Enough to get you stinking drunk? We’ll see. I'm all for equality but Australia in the #Eurovision ? 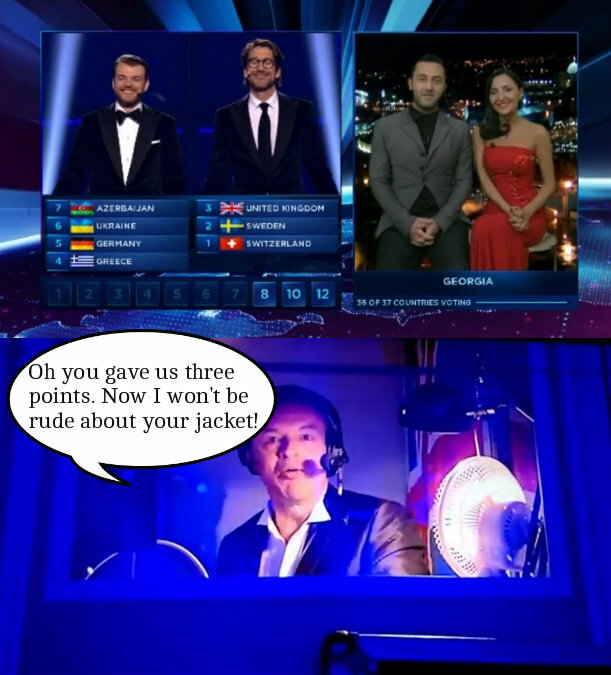 This is the Eurovision. Snarking is not allowed (much). DRINK. Look! IT’S US! IT’S US! Waaaheeyy! It’s looking rare at this year’s competition, but if it happens, it MUST be commemorated. You might as well go for broke at this stage. DOUZE POINTE FOR ALL! Email “The Great Eurovision 2015 Drinking Game”. Feedback on “The Great Eurovision 2015 Drinking Game”.